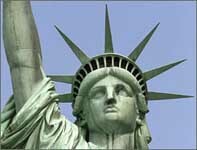 Friday is the Statue of Liberty's 125th birthday. Student's can practice scaling with ratios, multiplication factors, or similar figures as they engage in the news of the day, learn a little about the statue's history, see some amazing old photos and even decipher a few Roman numerals. For members we have solutions and suggested teaching options.